Yes, oils are for pets too. 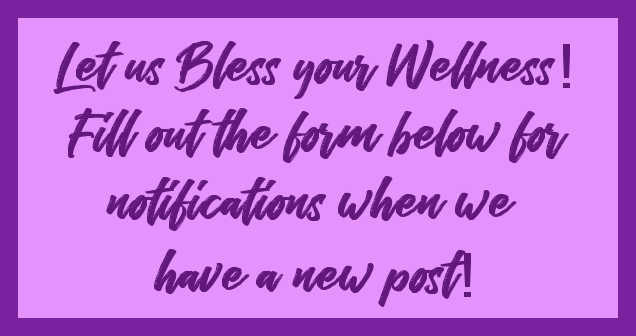 If you didn't catch our post the other day about pets and oils, make sure you go back to the previous post!! So.......The other night my dog must not have been feeling well. Pacing all around the house after we had gone to bed. She had water and had already gone potty. She just would not settle down on her bed like she normally does. I finally shut her in our room. Still she paced around the room, back and forth, back and forth, panting off and on. Walking in and out of the bathroom with her nails going ticky tacky on the vinyl. It was driving me crazy and keeping me from going to sleep. I finally got up and put some Digize essential oil on her tummy. Her tummy must have been what was bothering her, as the Digize did the trick. She laid down and went to sleep. Love my oils. 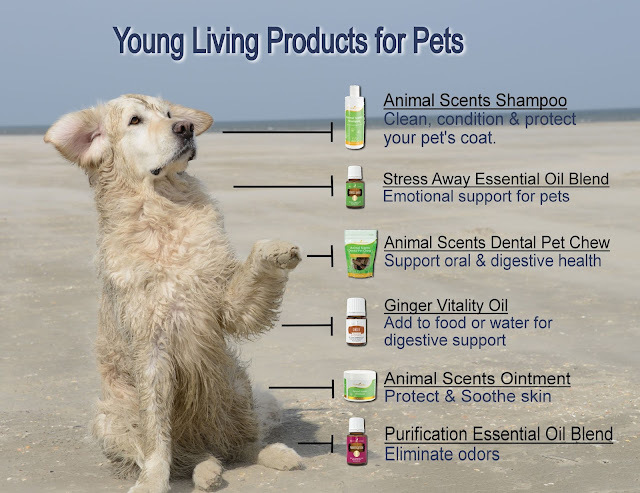 Did you know that Essential Oils are good for pets too! Yup! Here are just a few suggestions for your best friend. Let us know when you want to use essential oils with your dog and Leah or Ann can help you out. You can also use T-Away Essential Oil blend to help dogs deal with stress AND Lavender Essential Oil does the trick as well. 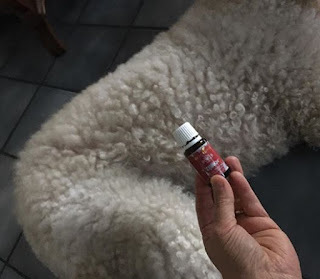 Need an oil to help your pooch who has been sprayed with a skunk? Purification to the rescue! Treat fido to wellness just like you! The Why behind the Cool!! We posted about the brand new Cool Azul Pain Cream not too long ago. Now, here is a video with some science behind the cream. 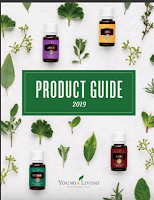 This Cool Azul Video is produced by Young Living. We hope that you enjoy!! It is only about 2:30 minutes long and easy to understand. Enjoy!! It took me a while but I have finally understood why I really needed it long ago. Thieves Household Cleaner. Let me count the ways that I love you!! AND........if you didn't know about it already, our Oil Club Oil of the month for August is THIEVES!! If you would like to be a member of our Oil Club it is $5 for the first month and $3 for subsequent months. An inexpensive way to learn about Essential Oils!! Try it, you'll like it!! Comment below and we'll get you set up. We have a private Facebook page set up for Oil Club members too! Do you have SLS in your products? What is SLS? Sodium Lauryl (or Laureth) Sulfate! It is a cheap chemical that is used in tons of products from household cleaning products to many products that you apply to your body. Your shampoo and toothpaste usually have this chemical as well as your bathroom cleaning products. Click here to see a list of all the products on the market with this additive! about SLS that made me want to eliminate it from my daily regime. Sodium Laureth Sulfate (SLES), in some circumstances, can become contaminated with Dioxane. This largely depends on the manufacturing process. Dioxane is a suspected carcinogen and lasts much longer in our bodies, primarily because the liver cannot metabolize it effectively. While it’s considered less of a skin irritant when compared to SLS, there are underlying concerns over its continued use in beauty products. Yikes! Do I want to chance that my product isn't contaminated? NO!!! You may have already read about the way I switched out my shampoo and conditioner. Click here to read about that. So, today, I want to talk about Thieves toothpaste. I switched out the toothpaste I was using that contained SLS with this product. I truly LOVE this Young Living product. Last fall when I had my teeth cleaned, I had been using the product for only three months. My hygienist asked me what I was doing different because there was a big difference in the amount of tarter on my teeth! Well, the toothpaste was the only change. That is a win for me!! Does it contain SLS? NO!!! Here are the ingredients: Water, Calcium carbonate, Cocos nucifera (Coconut) oil, Sodium bicarbonate, Glycerin, Xylitol, Xanthum gum, Mentha piperita† (Peppermint) oil, Mentha spicata† (Spearmint) leaf oil, Stevia rebaudiana leaf extract, Lecithin, Eugenia caryophyllus (Clove) bud oil, Ocotea quixos† (Ocotea) leaf oil, Cinnamomum verum† (Cinnamon) Bark oil, Citrus limon† (Lemon) peel oil, Eucalyptus Radiata† leaf oil, Rosmarinus officinalis† (Rosemary) leaf oil. I am so pleased with the lack of chemicals. It helps me on my quest to eliminate chemicals in my beauty regime and my home! Cleaning Make & Take coming! Are you a local person who would like to have some fun! 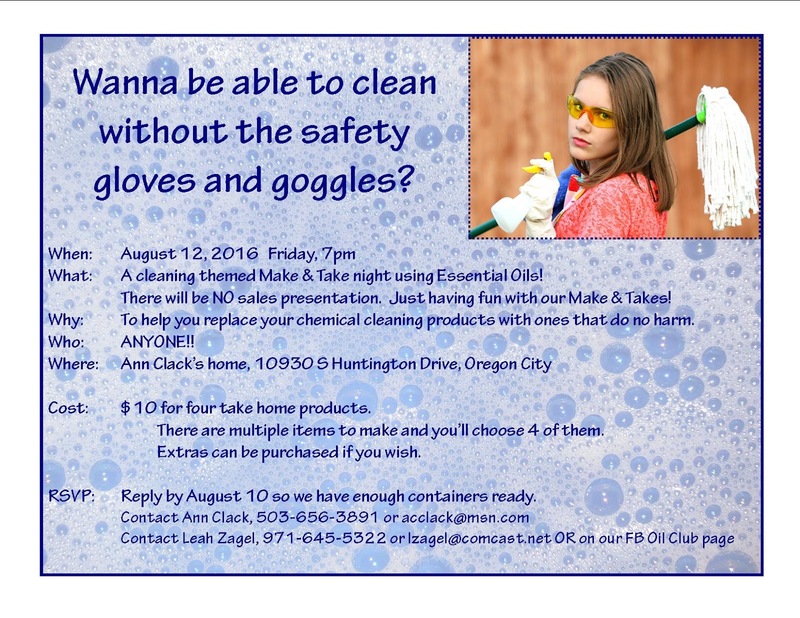 Leah and I will be hosting a make and take for cleaning items using essential oils. Make you cleaning supplies user friendly. Ditch your goggles and gloves and use products that won't harm you or the environment. See the RSVP info on the invite below! We hope to see you there!